Dr. Gala Gorman and Charlie Frangos are published authors who focus on creating tools and techniques that make addiction recovery resilient. They take a significantly different, holistic, approach in their work whether they’re dealing with someone in active addiction or well down the road to recovery. They believe that addiction is just a symptom of an underlying cause…a temporary and reversible malfunction of the brain. Heal the underlying cause and the symptom goes away. 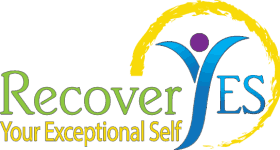 Charlie holds a Master’s Degree in Mental Health Counseling and is a Certified Practitioner in Rapid Resolution Therapy, is a Daring Way facilitator, a CSAT and is trained in EMDR. They draw on their training and personal experiences to help those who are ready to venture down the path to recovery. They have developed the programs and services at RecoverYES to support the specific needs of people in recovery from addiction. RecoverYES belongs to the Association of Global New Thought (www.agnt.org). New Thought is a spiritually motivated way of life that embraces the ancient wisdom traditions of east and west. New Thought is committed to global healing through personal transformation,community-building, interfaith, intercultural, and interdisciplinary understanding, and compassionate activism.